Gas is one of the most popular credit card rewards categories. That’s no surprise, as most Americans rely on gas-powered cars to get around and are always searching for ways to save money on gas. Many general-purpose cash back credit cards include gas or gas station purchases as a regular rotating category, while others feature permanent cash back on gas buys. When deciding which card best fits your needs, pay special attention to any spending caps, brand restrictions, and time limits that could eat into your earning power. Read each card’s fine print to get the lowdown on any exclusions or restrictions. For instance, most general gas credit cards that offer cash back at “all U.S. gas stations” specifically exclude warehouse clubs like Sam’s Club and Costco, which sell discounted gas and have their own cash back rewards programs. And pay special attention to interest rates, which can sometimes be higher than those of non-rewards credit cards. Caveats aside, these are the best gas and gas station credit cards available today. The Blue Cash Preferred Card from American Express has one of the best gas rewards programs around: 3% unlimited cash back on purchases at all U.S. gas stations, with no spending caps or other restrictions. You also earn 6% cash back on supermarket purchases up to $6,000 per year. Plus, you get 1% cash back on all non-gas and non-supermarket purchases, with no limits. However, there’s a $95 annual fee. Other benefits include a nice welcome offer and generous intro APR period. You can redeem your cash back rewards as a statement credit, gift card, and general merchandise, starting at $25. Welcome Offer: Earn $150 cash (statement credit) when you spend at least $1,000 in the first 3 months of card membership. Key Fees: There’s a $95 annual fee. Cash advances and balance transfers cost the greater of $5 or 3%. Foreign transactions run 2.7%, and late and returned payments both cost $37. Introductory APR: There is a 0% purchase and balance transfer APR for 12 months. After that, regular variable APR applies. Other Perks: Card membership has a host of fringe benefits, including access to cardholder-only entertainment events and return protection, which compensates you up to $300 per item for attempted returns rejected by merchants. 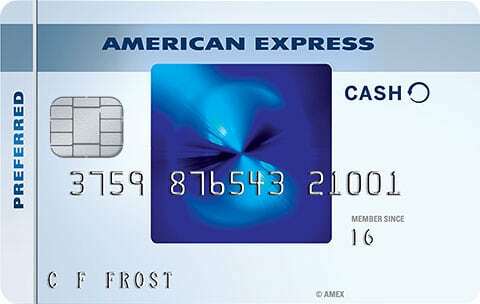 See our American Express Blue Cash Preferred Card Review for more information. Find out how you can apply for this card here. The Costco Anywhere Visa® Card by Citi has a generous gas benefit: 4% cash back on the first $7,000 in gas purchases each year. This rate applies on gas purchased at all U.S. gas stations, not just Costco filling hubs. Above the $7,000 spending threshold, gas purchases earn unlimited 1% cash back. Eligible restaurant and travel purchases earn unlimited 3% cash back worldwide, and Costco purchases earn unlimited 2% cash back in-store and online. All other purchases earn unlimited 1% cash back. If this card has a drawback, it’s the de facto $60 annual fee for regular cardholders. Like all warehouse stores, Costco charges an annual membership fee, and you won’t qualify for this card without agreeing to pay it. That said, Costco membership promises deep savings for frequent shoppers, so this is one credit card annual fee that pays for itself without much trouble. A foreign transaction fee waiver sweetens the pot further. Sign-up Bonus: This card has no sign-up bonus. Key Fees: There’s no annual fee with a paid-up Costco membership, which costs $60 for a standard (Gold Star) membership and $120 for a premium (Executive) membership, plus applicable sales tax (if any). There is no foreign transaction fee. Balance transfers cost the greater of $5 or 3% of the transferred amount, and cash advances cost the greater of $10 or 5%. Introductory APR: There is no 0% APR introductory promotion. Other Perks: The trip cancellation and interruption protection benefit is an important travel insurance coverage that reimburses you if you need to cancel or cut short a covered trip on short notice due to a medical emergency or another covered reason. Other fringe benefits include complimentary rental car loss and damage coverage and extended warranties on select purchases with existing manufacturers’ warranties. See our Costco Anywhere Visa® Card by Citi Review for more details. If you’re interested in the nearly identical business version of this card, check out our Costco Anywhere Visa® Business Card by Citi Review. Chase Freedom is a general-purpose cash back credit card that offers 5% cash back on purchases up to $1,500 in quarterly rotating categories. All other purchases earn 1% cash back, with no spending caps or earning limits. Notably, there’s no annual fee. You can redeem for checks, statement credits, direct deposits, and purchases through Chase’s Ultimate Rewards portal. There’s no redemption minimum. While gas and gas stations aren’t always part of the 5% club, Chase Freedom has historically included at-the-pump gas or gas station purchases (covering all U.S. brands, in both cases) in at least 1 of its 4 annual 5% bonus rotating categories. In other words, you can expect your Chase Freedom card to pay 5% on gas purchases roughly 3 or more months out of the year. Plus, there’s a really nice sign-up bonus and a solid intro APR period. However, you need to manually activate your 5% cash back categories before the middle of their expiration month. Sign-up Bonus: Earn a $150 cash back bonus when you make at least $500 in qualifying purchases within 3 months of account opening, and an additional $25 when you make a single purchase within the same initial 3-month period. Key Fees: There’s no annual fee. The foreign transaction fee is a flat 3%. Balance transfers cost the greater of $5 or 3% of the transferred amount, and cash advances cost the greater of $10 or 5%. Introductory APR: There is a 0% purchase and balance transfer APR for 15 months. After that, regular variable APR applies. Other Perks: The Chase Purchase Protection insurance product covers all purchases made with your Chase Freedom card for 120 days, up to $500 per claim and $50,000 per account. See our Chase Freedom Card Review for more information. Find out how you can apply for this card here. Chase Ink Business CashSM is a business credit card with a very generous gas reward: 2% cash back on combined gas station (in-store and at the pump) and restaurant purchases, up to $25,000 per year. You can redeem for statement credits, direct deposits, checks, and Ultimate Rewards purchases, starting at a $20 minimum. Ink Business Cash’s rewards don’t stop there. The card also offers 5% cash back on office supply and communications purchases (cellular phone, landline, Internet, and cable TV services), up to $25,000 per year. All other purchases earn 1% cash back, with no spending caps or earning limits. Other perks include a nice sign-up bonus, no annual fee (which is somewhat unusual for a business card), and relatively low APR. Remember that the Ink Business CashSM is meant for business financing. If you don’t own your own business, you likely won’t qualify for this card. Sign-up Bonus: Earn $500 bonus cash back when you spend at least $3,000 in qualifying purchases within 3 months. Key Fees: There’s no annual fee. Foreign transactions cost 3%. Balance transfers cost the greater of $5 or 5%, and cash advances the greater of $15 or 5%. Late payments range from $15 to $39, depending on balance size. Introductory APR: 0% on purchases for 12 months. After that, regular variable APR applies. Other Perks: Extended warranty protection extends warranties lasting less than three years for an additional year at no additional charge. 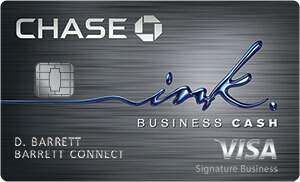 See our Chase Ink Business Cash Card Review for more information. Find out how you can apply for this card here. Discover it is a general-purpose rewards credit card that offers 5% cash back on purchases up to $1,500 in quarterly rotating categories. Gas station purchases (in-store and at the pump, all U.S. brands) reliably rotate into the 5% wheelhouse at least 1 quarter per year, and sometimes more. Like Chase Freedom, there’s no annual fee. Like Discover it Chrome, there are no cash back redemption minimums, and you can redeem for direct deposits or statement credits. All other purchases earn 1% cash back, with no spending limits, so Discover it is a great compromise between a pure gas rewards card and an everyday spending card. Plus, Discover doubles your cash back in the first year. Sign-up Bonus: There’s no sign-up bonus aside from the first-year double cash back benefit. Fees: There’s no annual fee or foreign transaction fee. Balance transfers cost 3%, and cash advances the greater of $10 or 5%. There’s no late fee for your first late payment, but it costs $35 per late payment thereafter. Introductory APR: 0% on purchases and balance transfers for 14 months. After that, regular variable APR applies. Other Perks: The Freeze It feature turns off many account features, such as purchasing and cash advances, with one click. You’re also entitled to a free FICO credit score each month. See our Discover it Card Review for more information. Discover it Chrome pays 2% cash back on at-the-pump gas and dining purchases made in the U.S., up to a combined $1,000 per quarter. To get the most out of this card’s gas-buying power, use it sparingly at restaurants. During your first year of card membership, Discover automatically doubles all the cash back you earn – a strong incentive to maximize your rewards from the get-go. There are no redemption minimums – you can redeem any time, in any amount, for statement credits and direct deposits. You also get 1% unlimited cash back everywhere else, so Discover it Chrome is a nice everyday card as well. Low fees, including no annual fee, and a relatively low purchase APR help too. If you drive a lot and spend more than $1,000 in gas per quarter, consider upgrading to another gas credit card. Sign-up Bonus: There’s no sign-up bonus, aside from the first-year double cash back perk. Key Fees: There are no annual fees or foreign transaction fees. Cash advances cost the greater of $10 or 5%. Balance transfers cost $3, and late and returned payments run $35. Introductory APR: There is a 0% purchase and balance transfer APR for 14 months. After that, regular variable APR applies. Other Perks: You get a free monthly FICO score and don’t have to pay a late fee when you miss your first payment. See our Discover it Chrome Card Review for more information. The Hilton Honors Amex Ascend card is arguably the best hotel credit card for gas rewards. If you frequently travel for business and have a long commute to the home office, or need to cover an extensive sales territory by car, this is the card for you – provided you can find a Hilton property on the road. All gas station purchases earn unlimited 6 Honors points per $1 spent. So to do supermarket and restaurant purchases. Qualified purchases at Hilton properties earn a whopping 12 points per $1 spent, while all other purchases earn unlimited 3 points per $1 spent. Award night redemptions start as low as 5,000 points per night at the lowest-tier Hilton properties, so you can treat yourself to a free stay after as little as $834 in gas spending. If business takes you abroad, you’ll make out well with no foreign transaction fee here. Sign-up Bonus: Earn 125,000 bonus Hilton Honors points when you spend at least $2,000 during the first 3 months your account is open. That’s worth up to 25 free nights when redeemed for award stays at the lowest-tier Hilton properties. Key Fees: The annual fee is $95. There’s no foreign transaction fee. Cash advances cost the greater of $5 or 3%. Other Perks: This card comes with a slew of benefits for frequent travelers, including a free weekend award night every year in which you spend at least $15,000, complimentary Hilton Honors Gold status as long as your account remains in good standing, and up to 10 free visits to participating Priority Pass airport lounges. See our Hilton Honors Amex Ascend Card Review for more information. The Citi Premier Card is a travel rewards credit card with a great gas benefits. You earn 3 points per $1 spent on all travel purchases, including in-store and at-the-pump gas station purchases across the U.S., as well as 3 points per dollar spent on airfare, hotels, and rental cars. You earn 2 points per $1 on dining and entertainment purchases, and 1 point per $1 spent on everything else. Redeem your points at Citi’s ThankYou® portal, where you can buy airfare and other travel items, gift cards at major merchants, apparel, electronics, statement credits (your best bet if you’re looking for a cash equivalent), direct purchases with retailers like Amazon and Best Buy, and much more. Redemption minimums vary by redemption method. Another perk: no foreign transaction fee. Sign-up Bonus: Earn 50,000 bonus points when you make at least $4,000 in purchases with your card within the 3 months of opening your account. Key Fees: The annual fee is $95, waived for the first year. There’s no foreign transaction fee, but late and returned payments both cost $35. Balance transfers run the greater of $5 or 3%, and cash advances cost the greater of $10 or 5%. Other Perks: Citi’s Private Pass program offers VIP access and early sales for concerts, sporting events, and other entertainment. Separately, this card comes with offers personalized concierge services, such as 24/7 travel and event booking. See our Citi Premier Card Review for more information. U.S. Bank Business Edge Cash Rewards is another no-annual-fee business credit card meant for small business owners. With unlimited 3% cash back on at-the-pump gas, cellular, and office supply purchases, it’s an on-the-go business owner’s dream – and eliminates worry about sticking to spending limits. The redemption minimum is $25, and you can redeem for statement credits, direct deposits (U.S. Bank accounts only), or Mastercard gift cards. Like the Ink Business Cash Card, this card is only for business owners. If you don’t own your own business, look elsewhere. To maximize the gas benefit, order additional credit cards (at no extra charge) for your field employees. Sign-up Bonus: Earn $200 bonus cash when you spend at least $1,000 in eligible purchases during the first 3 months your account is open. Key Fees: There’s no annual fee. Balance transfers cost the greater of $5 or 3%, and cash advances cost the greater of $10 or 4%. Foreign transactions run 2% if denominated in dollars, and 3% if denominated in foreign currency. Late fees range from $19 to $39, depending on balance size. Introductory APR: There is an intro 0% purchase APR for 9 months. After that, variable regular APR applies. Other Perks: You can get an unlimited number of employee cards (tied to the same account) at no additional charge. All extra employee cards also earn cash rewards. 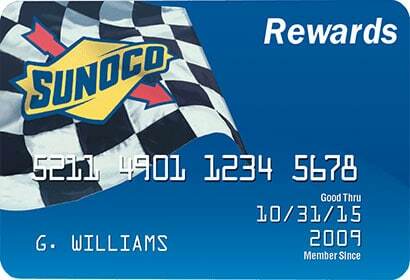 The Sunoco Rewards Card offers a simple, powerful gas reward: unlimited $0.05 off per gallon of gas purchased at U.S. Sunoco gas stations. The discount is automatically applied with no action required on your part, except to use the card to purchase gas, and no other restrictions. Watch out for this card’s high APR. Key Fees: There’s no annual fee or foreign transaction fee. Late payments cost $38, and the cash advance fee is the greater of $10 or 5%. Other Perks: Get unlimited extra cards for family members at no additional cost. The Citi Rewards+? Card earns 2 ThankYou points per $1 spent on eligible gas station purchases, up to $6,000 in annual combined category spending. Supermarket purchases also earn 2 points per $1 spent and count toward the $6,000 spending cap for bonus point earnings. Above the annual cap, all purchases, including gas station purchases, earn unlimited 1 point per $1 spent. Like ThankYou points earned through Citi Premier, you can redeem for pretty much anything at the ThankYou portal, and you can shop with points at major merchants like Amazon and Best Buy as well. Redemption values differ, though – check the ThankYou portal for details. Sign-up Bonus: When you spend at least $1,000 in eligible purchases during the first 3 months your account is open, you’ll earn 15,000 bonus ThankYou points. That’s enough to redeem for $150 in gift cards. Key Fees: There’s no annual fee. The foreign transaction fee is 3%. Late payments cost $38, and the cash advance fee is the greater of $10 or 5%. Introductory APR: 0% APR on purchases for 12 months from your account opening date, and 0% APR on balance transfers for 12 months from the date of first transfer. Other Perks: Like Citi Premier, this card comes with Citi Private Pass, Citi Concierge, and some other value-added perks. See our Citi Rewards+? Card Review for more information. 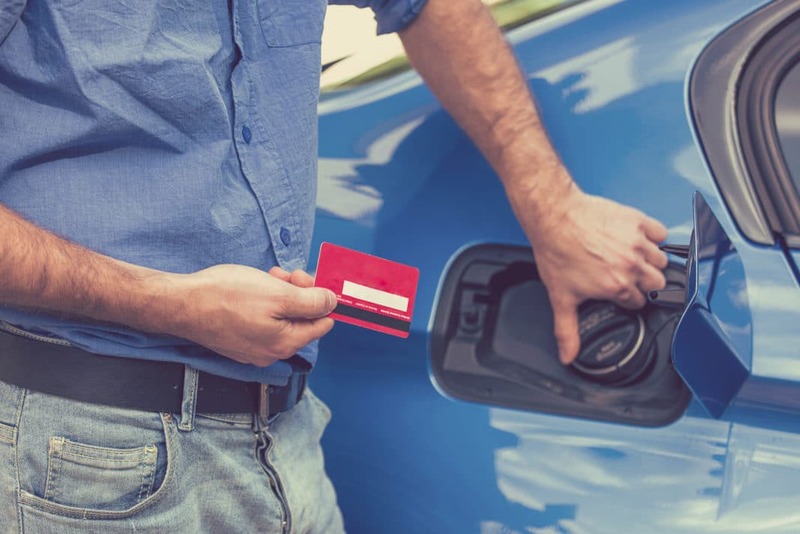 Since most American households own at least one car, and gas is therefore a necessary expense for most people, it’s no surprise that gas is such a popular credit card rewards category. On the other hand, even the most committed drivers spend money on plenty of things other than gas. If you drive often, by all means, sign up for one of the gas rewards credit cards. However, consider pairing your gas card with a general-purpose rewards card that offers cash back on a wider range of purchase types – or all purchases, regardless of type. Capital One Quicksilver Cash Rewards and Citi Double Cash are great examples of generous general-purpose cards. And before you submit your gas credit card application, make sure you’re actually going to use it enough to make it worthwhile. Consider how much you drive and what type of car you own, which merchants accept the card, whether you’re allowed to use it at grocery store or warehouse club gas stations, and the regular purchase APR. Always read your card’s fine print, and check for changes regularly after you start using it. Finally, if at all possible, pay your balance in full each month. If paying in full is a challenge, opt for a low APR credit card instead. What’s your favorite gas rewards credit card?